To plan, visualize, and build smart communities, local governments are tapping Esri partners around the world to help them implement enterprise GIS and use innovative apps to solve complex problems. With such focused solutions, cities and towns are making data more widely available to employees and citizens—on any device—which is generating operational efficiency, reducing costs, and improving returns on investment. The Cape Cod Commission (CCC), a regional planning agency that supports communities in Cape Cod, Massachusetts, is tasked with protecting the features that make the cape special and give it its quintessential New England feel—including the area’s natural vistas and historic architecture. To balance protecting the environment with the demands of the local economy, CCC uses GIS to measure and model development changes across the peninsula. With Bergmann Associates' assistance, the Cape Cod Commission (CCC) was able to use ArcGIS Online to compare existing and proposed development side by side. Last summer, CCC contracted Bergmann Associates to implement 3D geodesign tools for its planning team. Because CCC already had extensive ArcGIS infrastructure, it was important that the new tools leverage its existing GIS investments and staff skills. Working with an Esri partner meant that CCC’s new 3D capabilities could take full advantage of the organization’s geodatabase and planning datasets. Bergmann employed Esri CityEngine to build a 3D basemap that includes more than 260,000 3D models, covering every structure on the cape. While Bergmann expected the basemap modeling to be the most challenging part of the implementation, project manager Eric Brady said they found otherwise. “Using CityEngine CGA scripting language, it turned out to be one of the easiest,” he remarked. 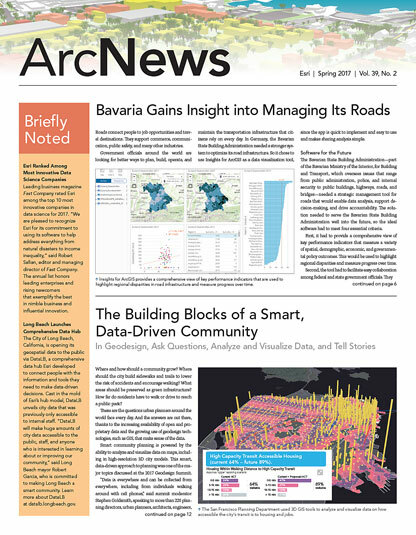 Bergmann also helped CCC configure 3D capabilities by using an ArcGIS Pro add-in called Bergmann Impact 3D. 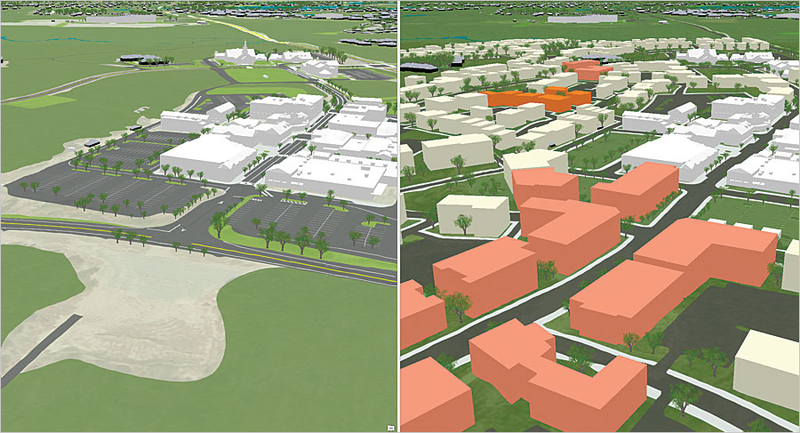 With Impact 3D, stakeholders can see how new properties will affect the existing environment. The add-in helps users model and compare development scenarios to evaluate the potential effects on the natural and built environments, traffic and parking, employment, and other variables. Planners can even modify scenarios on the fly during live meetings with collaborators and developers. The organization has applied the tools to three development plans: East Hyannis, Capetown Plaza, and Mashpee Commons. With a population of more than 80,000, Brooklyn Park is the sixth-largest city in Minnesota and the fourth-largest in the Twin Cities metropolitan area. Until 2012, the city’s relatively small GIS department struggled to keep its data, maps, and apps up-to-date. 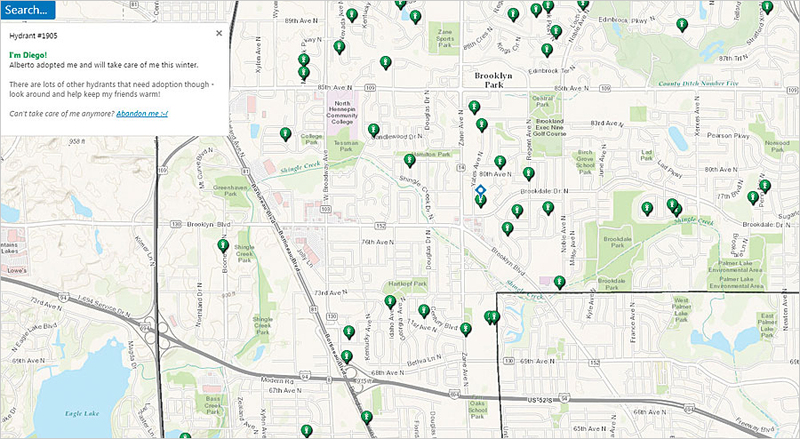 In 2013, Brooklyn Park implemented Geocortex Essentials, an ArcGIS solution from Latitude Geographics. With this, the city developed internal and public-facing GIS apps that make important information easier to access. The main internal app, CityView, connects staff to all the city’s major data sources. With a single search, users can find property information; land management and permitting information; police records; and data stored natively in the city’s enterprise GIS, which contains more than 70 maps and image layers. CityView includes workflows for printing maps and mailing labels, and several map layers contain links to related documents, such as plat drawings and utility as-built drawings. CityView provides seven department-focused apps as well. Adopt a Hydrant, part of Brooklyn Park's crowdsourcing campaign, aims to get residents to voluntarily shovel out their fire hydrants after it snows. Brooklyn Park also developed two public-facing apps. The Neighborhood Info app lets residents, businesses, and real estate agents view more than 50 variables—from utility and school district information to elected officials and nearby parks—for any given property. And the Adopt a Hydrant app, part of the city’s crowdsourcing campaign, encourages residents to take responsibility for specific fire hydrants and shovel them out of the snow following winter storms. Brooklyn Park’s internal apps have significantly streamlined business operations and made it easier for staff to access data and GIS resources outside their departments. The public-facing apps have also seen strong usage across the community. In 2016, Neighborhood Info was used 1,700 times, and residents adopted 76 fire hydrants through Adopt a Hydrant. Working with ArcGIS Online and Geocortex Essentials has turned the city’s attention to designing simple, powerful web GIS apps. “By maintaining a focus on building easy-to-use apps, we’ve seen [a] great uptake in the use of our internal and public-facing applications,” said Nerge. 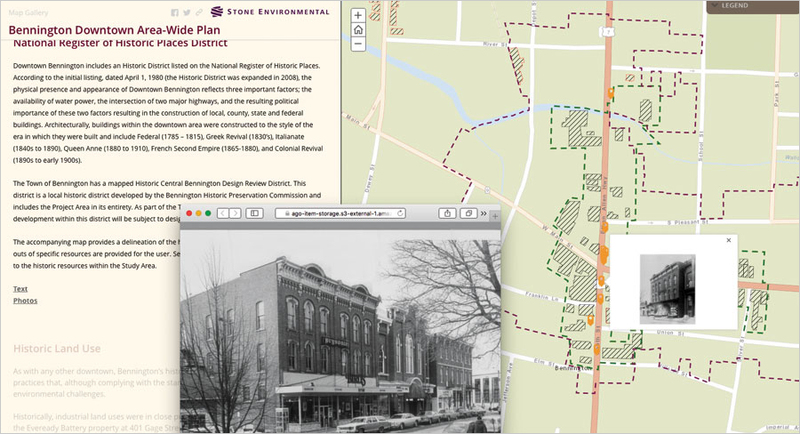 With help from Stone Environmental, Bennington, Vermont, built a story map that summarizes the town's economic history and proposed development scenarios. Fostering and sustaining a vibrant downtown is critical to any planning commission’s vision for having an economically healthy community. That’s why the town of Bennington, Vermont, worked with private and public partners—including Stone Environmental—to create the Bennington Downtown Area-Wide Plan. As a historical manufacturing center, Bennington faces major redevelopment challenges. Shifts in industrial and commercial activity throughout the twentieth century have left numerous vacant and underutilized properties. Many of these sites are classified as brownfields, meaning they require environmental remediation. To successfully address these challenges, Bennington needed a holistic plan for revitalizing its downtown area. Using ArcGIS, Stone helped the town perform an environmental and infrastructure assessment. Information related to the appraisal—including data about historical land use, natural resources, infrastructure, and brownfield sites—was collected, stored, and managed in a geodatabase. Stakeholders can now use ArcGIS Online to quickly retrieve this information for any parcel in the downtown area. The final downtown plan includes the results of the environmental assessment, a set of conceptual visions for the downtown area, and a detailed implementation strategy. ArcGIS maps bring the development scenarios to life, which is especially helpful for prospective partners as they evaluate property development opportunities. To help communicate the plan effectively to stakeholders, Stone also built an interactive story map. It recounts Bennington’s economic history, summarizes the plan’s recommendations, and illustrates the proposed development scenarios. The town presented the story map at a public meeting to gain community buy-in for the plan. To date, the development plan has helped spur Bennington’s Putnam Block redevelopment project, which will create a mixed-use space with offices, residences, retail stores, and restaurants. Bennington anticipates engaging in other, similar public-private partnerships soon as well. The City of Fayetteville, North Carolina, is constantly under pressure to provide more and better services to its constituents—without increasing staff, of course. To accomplish this, the city needed more streamlined workflows for delivering quality spatial information. To provide more and better services to its citizens, Fayetteville, North Carolina, worked with Timmons Group to implement an enterprise-wide GIS architecture, complete with an ArcGIS Open Data site. Working with Timmons Group, the city implemented an enterprise GIS using ArcGIS Online. Timmons helped the city document its needs and develop a road map that leverages its existing technology investments. The resultant system lets staff and decision-makers access accurate, up-to-date geospatial data at any time. Employees use Collector for ArcGIS to gather data and edit information about city assets in the field. Many of the city’s apps are also now integrated with ArcGIS Online, including apps from Esri partners Cityworks, RouteSmart Technologies, and SunGard Public Sector. These apps have improved city workflows and substantially increased Fayetteville’s return on investment in technology. The city estimates that implementing ArcGIS—along with apps like RouteSmart, which helps the city optimize daily trash pickup schedules—has saved tens of thousands of dollars. Fayetteville also estimates that employing Survey123 for ArcGIS for code enforcement may cut operational costs by 40 percent. In addition, the city has reportedly saved another $75,000 by implementing ArcGIS Open Data instead of a stand-alone open data solution. 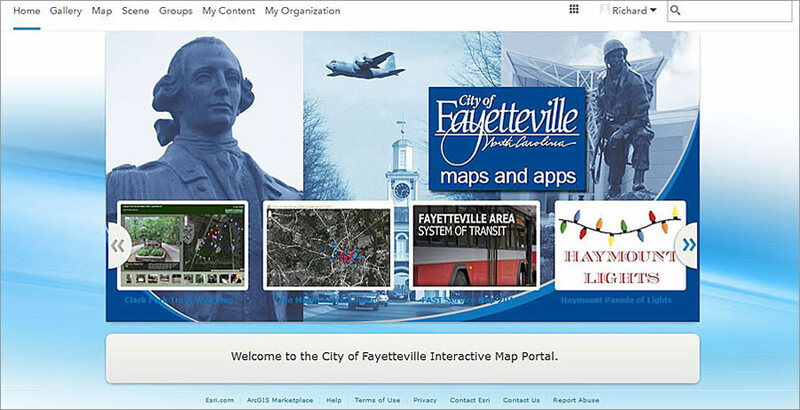 The City of Fayetteville’s public-facing GIS—complete with best practices for search engine optimization (SEO) that were implemented by Timmons—makes it easy for citizens to interact with open data and engage with the city. Fayetteville is also using ArcGIS Workflow Manager and ArcGIS Data Reviewer to improve the quality of its essential spatial data, such as storm water and zoning data. This lets the city deliver more accurate and authoritative information to its citizens. Esri’s 2,300 global partners provide customer-focused, geoenabled solutions that span dozens of industries. Products and services range from configured apps and custom-built solutions to complete ArcGIS system implementations and content. To search and discover partners, solutions, and services that meet your needs, visit esri.com/partners.